If you follow golf, you must be aware of the CIMB classic, a 72-hole stroke play event that features players from golf’s three official sanctioning bodies-the PGA tour, the Asian Tour and the Professional Golf Association of Malaysian (PGAM). This annual event which, has just completed its fourth edition this year, was hosted from 24th to 27th October, on the lush greens of the Kuala Lumpur Golf and Country club. The CIMB GROUP, a leading Malaysian Financial Services group and indigenous ASEAN investment bank as always sponsored the tourney. This year’s event, opened a new chapter in the annals of tournament’s illustrious history, for it was designated as the PGA Tour’s first official FedEX Cup event in Asia and the field for the competition this year, featured 78 outstanding players including 60 from the PGA tour, 10 from the Asian tour and 8 sponsor’s exemptions. The CIMB classic, which has previously attracted big names like Tiger Woods and Ben Crane, this year, had a mixed field made up of experienced pros and rookies. Participating in the event, were luminaries like 5-time Major winner Phil Mickelson, past champions Bo Van Pelt, Nick Watney and other leading lights like Ernie Els, Sergio Garcia and K.J. Choi, who played alongside emerging talents from Asia and beyond, like Bae Sang Moon, Rashid Ismail, Siddikur Rahman and India’s own Shiv Kapur. Up for grabs at the event, was a substantial prize purse of USD 7 million, along with an invite to the 2014 US Masters Cup, Ryder Cup points and a 2-year PGA TOUR exemption. The 2013 CIMB classic was won by USA’s rising golf star, 30-year-old Ryan Moore, in an exciting sudden-death play-off with Gary Woodland on No.18. Thunderstorms and fading light had halted play on Sunday evening with Woodland and Moore poised at 14 under 274 and the playoff had to be postponed until the next morning. When play resumed, Moore hit an 8-iron to three feet and then when Gary Woodland’s chip from just off the green came up short, Moore made his birdie putt to notch up his third PGA tour victory as he won his first CIMB classic. One couldn’t have asked for a better finish to a truly exciting tournament. Want to experience the excitement first hand? 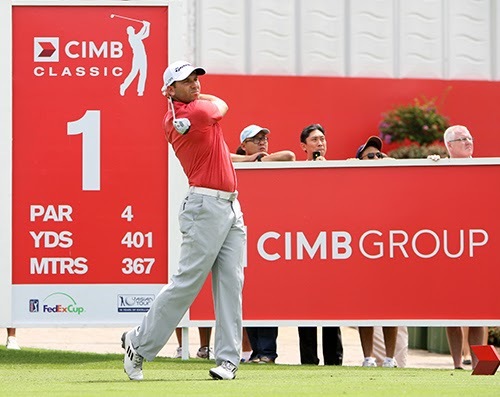 Why not book your ticket for the 2014 CIMB classic and combine it with a fun-filled holiday to scintillating Kuala Lumpur.